Even as her star continued to rise, TRAKGIRL kept both ears to the ground. The popular music maker has enjoyed accelerated success in recent years, collaborating with top-tier artists (Jhene Aiko, Belly, Luke James) and producers (DJ Dahi). The legendary No-ID even assumed a mentorship role in her life. Suffice to say, things are looking up for the creator born Shakari Boles. Yet the recurring lack of women in studios and conference rooms grew painfully clear as more doors opened and fewer females welcomed her in. Problem recognition led to prominent action. First, TRAKGIRL caught the public speaking bug and visited the likes of Spotify, NAMM and Georgetown University to touch on her experiences as a female producer. Then, after learning that female producers and engineers made up just seven percent of the community, she made moves to address the disparity head-on. 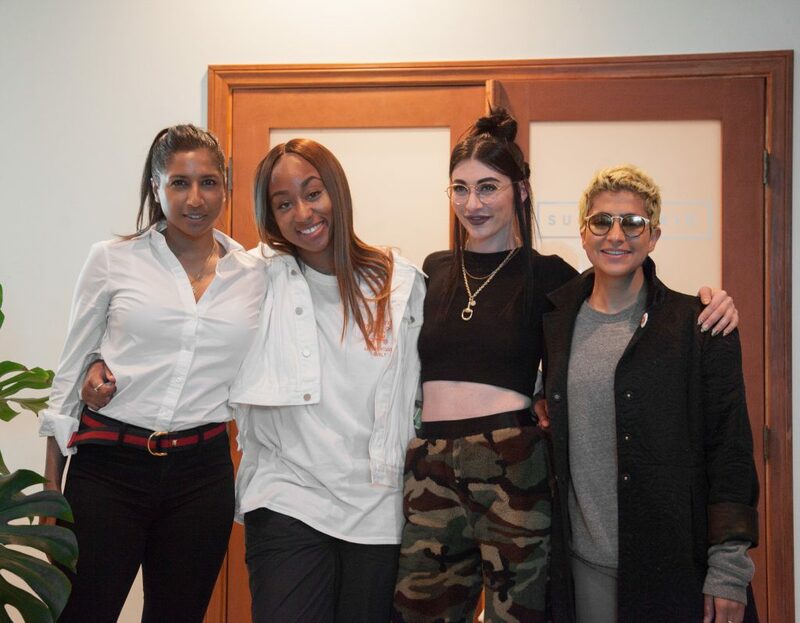 Wednesday night, May 2, TRAKGIRL curated and moderated the first installment of The 7% panel at Stem HQ, uniting a group of talented, accomplished women to spark conversation and inspire those in attendance. We spoke with TRAKGIRL about advice, self-empowerment and next steps in a brief but telling interview—read it below. Click here to read our photo recap of the inaugural 7% event. Stay tuned for news about the series’ bright future. What is your mission with the The 7% series? The mission for The 7% is to help create a platform for women to come together and be more unified. We’re lacking representation, especially for women producers and engineers. What better place to raise awareness and build resources than here in LA? Hopefully we can continue to grow and expand to different cities, too. This is so exciting for me. I have the jitters but I don’t have the jitters [Laughs]. It’s a good feeling. I really wanted to bring a lot of women together. Where did the idea first stem from? I had come across the seven percent statistic from the Audio Engineer Society. USC did a similar study in January. Out of 651 people sampled from the producer and engineering community, 98 percent were men. 2 percent women. I really want to increase visibility and create opportunities because we as women are out here. We are talented and qualified. We have to continue the conversation and help each other. The numbers are so unjustly disproportionate. Where do you look to find empowerment in an industry dominated by men? How do you empower yourself in an industry programmed to discourage that? I had to build this mental armor. It is male dominated. I just had to find strength in knowing I have a chance to create change, which is empowering in itself. One of my main goals is to inspire, and even if it’s one person, I met that goal. That possibility to inspire drives me. The chance to start creating a pathway for other girls is exciting. It’s important for younger girls to see role models in different music fields, to see resources available to them, to see they can do this. We have to lead by example. You’ve been exposed to many different facets of the industry. When you’re looking at music tech companies, labels, even schools, what do you hope to see from them to shift the status quo? A lot of these brands and companies have the power to create initiatives that promote inclusion, and I think you’re starting to see more of a women focus. Spotify’s Secret Genius initiative, with songwriting camps led by women, is super cool. For me, it’s important to collaborate with these brands and show I’m not just a talent but a leader. It’s important for me and for others to leave a positive impact in those meetings and be a voice, beyond just producing. When you hit rewind and think back to 12-year-old TRAKGIRL, how do you think your perspective has changed? What would you tell yourself? I would definitely tell her to continue having faith. Continue to focus on your craft and let the music speak. Don’t be afraid to defy the odds, push and make your voice heard. It will be discouraging, again and again, but if you keep pushing it can pay off. Block all distractions. What can men do to be better allies to women? We need men as allies because this is a male-dominated industry. Let us through the doors. Think about women you know when you need to bring someone in.